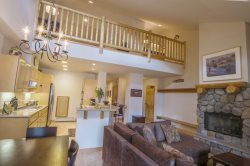 This cabin has been fully remodeled with all the luxury amenities in mind providing a warm mountain feel with an open great room. The fully equipped kitchen with features granite counters, gas stove and bar seating for four. There is also a large dining area with handmade table that seats ten just off the kitchen. Other amenities include a game area off the main living room, 42" TV with DVD and VCR, games, Foosball Table, and large deck off living room. Don't forget to take advantage of the year round activities that include skiing, snowboarding, cross-country skiing, snowmobiling, horseback riding, hiking, mountain biking, swimming, boating, and disc golf. Kirkwood has plenty of activities for your family any time of the year! - Loft Bedroom - Single Bunk Bed, Twin Bed and a Single Hide-A-Bed. 40" Flat Screen TV with Cable, DVD player and VCR. No Elevator Access. Must use stairs to access property. Nicole was amazing as usual. Always super helpful and friendly. Beautiful home. Could have used a deep cleaning. Lots of spider webs and mouse poop. MANAGER RESPONSE: We do deep clean out homes, but the home is in the mountains and we do have spiders and mice, which we do our best to exterminate as they appear.